Northwest Arkansas Gives Day is only one week away! Thursday, April 4, from 8 AM – 8 PM will be a day full of felines and online “FUN”draising for our animal residents. Floyd has become our spokes-cat for this campaign, partially because he takes a dashing picture but mainly because of his story. 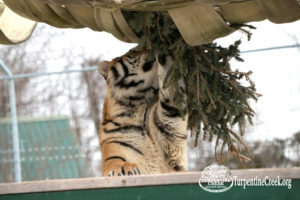 He was part of a six-tiger rescue we conducted in early January. All were suffering from obesity and genetic health issues; one tiger, Diesel, was diagnosed with a pre-existing case of feline infectious anemia and could not be saved despite the best efforts of our team. Floyd and his friends were survivors of the cub petting industry. Once they surpassed the legal age to be handled, they were set to be destroyed, but the facility we obtained them from took them in before their fate was sealed. When that facility was set to close, we were contacted to provide a home for the displaced tigers. Floyd was previously diagnosed with Metabolic Bone Disease and physical deformities in his limbs. The first several weeks of his time at the Refuge, he sought solace in his den and only emerged to provide hissy admonishment to those who were caring for him. He was scared. He was in pain. He was lost. Aside from the quick implementation of pain management for Floyd, the process of making him comfortable largely consisted of giving him space and allowing him to ease into Refuge life at his own pace. For the first time, he had no job duties or expectations- he was simply allowed to be a tiger, and it made a world of difference. Floyd’s personality has since blossomed and allowed us to truly get to know him. He enjoys sunning himself in the grass, napping under his log, and is especially fond of cedar tree enrichment. When he lets out one of his deep, “electronic” sounding chuffs, his eyes get huge and his forehead skyrockets upward. He has even been spotted rolling on his back- the ultimate sign of trust and peace for a large carnivore whose bellies are a vulnerable spot. 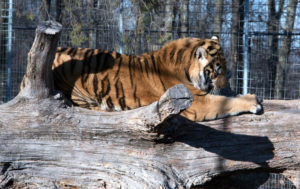 TCWR’s work not only centers around providing a lifetime, high-quality sanctuary for survivors of the Exotic Pet Trade, but also educating the public so they can help us advocate for laws to promote a safer, healthier future for big cats in captivity and eventually end the Trade. Your donation on NWA Gives Day will allow us to care for our current animal residents, the majority of whom mimic Floyd’s need for specialized care (medications, diets, and routine exams), while working towards a tomorrow where others are not abused and exploited in the name of profit. We are asking all of our supporters to donate at least $1 between the hours of 8 AM and 8 PM on Thursday, April 4, to help us reach our goal of $21,000. We will be doing giveaways and fun live videos on our social media pages as we celebrate saving lives. 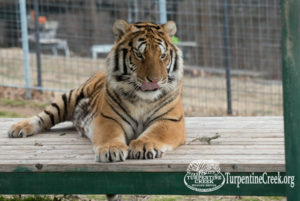 For more information about NWA Gives Day please visit: https://www.turpentinecreek.org/nwagives/. ON April 4th you can donate on the NWA Gives page – to count towards the bonus dollars that are available – or you can donate through our Facebook page, Donation Page, over the phone, or in the mail.